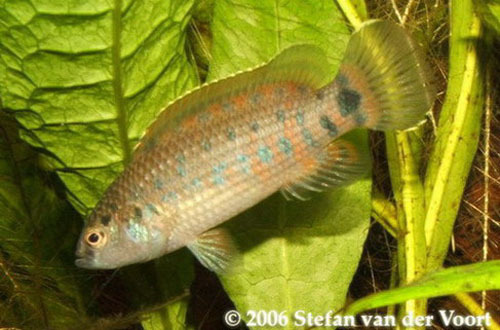 Adult male of Badis assamensis. Head detail of adult male. 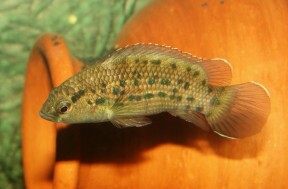 Male specimen with breeding colouration. 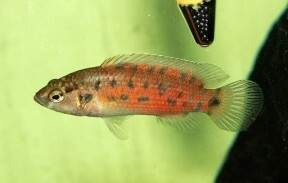 Adult male - normal colouration. The full extent of its range remains somewhat unclear. It was first thought to be endemic to the Brahmaputra River basin in Assam state, northeast India but may also occur in northern West Bengal close to the border with Assam. 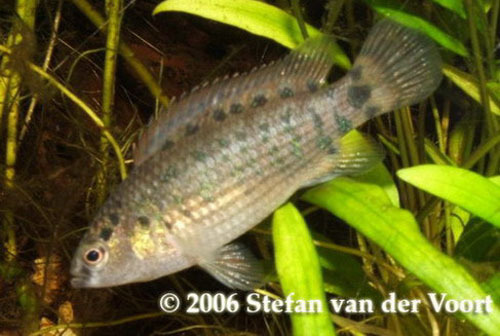 During research for their 2002 revision of the genus Kullander and Britz were unable to locate any type specimens in museum records and therefore designated a neotype which was collected from a tributary of the Dibru River in Dibrugarh District, northern Assam. The Dibru used to feed the Brahmaputra prior to the 1950 Assam-Tibet earthquake. The neotype locality is a slow-moving stream that flows through a forested area with trees growing down to the banks and into the water in some cases. The water is described as “stagnant” and “brownish”with a substrate of sand in which beds of waterlilies grow. B. badis was also found at the locality. This is the largest species in the genus and can grow to 65 – 75 mm. B. assamensis will thrive in a well-structured set-up with a sand or gravel substrate plus plenty of water-worn rocks and pebbles to provide cover. Plant species that can be grown attached to the decor such as Microsorum, Taxiphyllum or Anubias species can be added if you wish but aren’t essential. Driftwood twigs, branches, floating plants and leaf litter can also be used to lend a more natural feel while filtration and lighting need not be too strong. 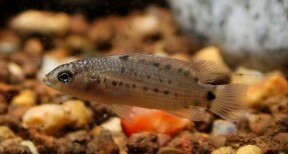 Some cave-like structures should be included to act as potential spawning sites; many breeders use half-coconut shells or up-turned clay plant pots with drilled holes or parts of the rim removed to allow the fish access. 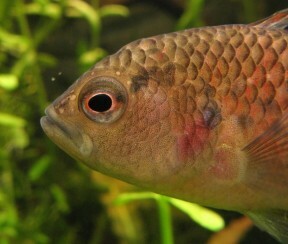 Can be kept in a community tank provided tankmates are chosen with care. 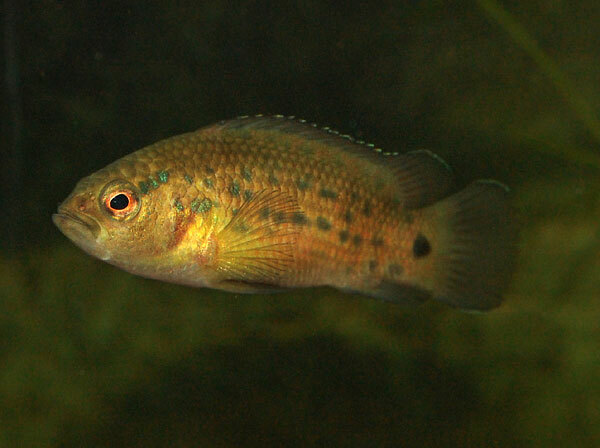 It is slow-moving with a retiring nature and may be intimidated or outcompeted for food by larger/more boisterous tankmates while very small fish may be predated upon. Peaceful, schooling cyprinids make good choices as do most gouramis because these tend to inhabit the upper parts of the tank. Accommodating it in a biotope-style community of Assamese fish is more tricky although suitable species from the region include Pethia gelius, Parambassis ranga, Colisa lalia and C. chuna. 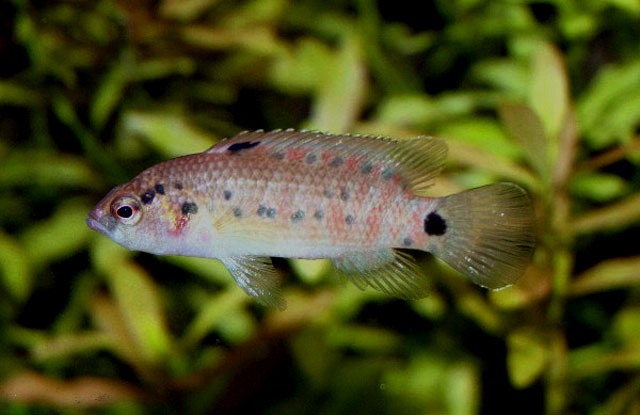 Certainly do not combine it with similar-looking, territorial bottom dwellers such as dwarf cichlids unless the tank is very large and never house it with other Badis species as hybridisation might occur. Also note that freshwater shrimp of the popular genera Caridina and Neocaridina, and certainly their young, may be preyed upon.